Cartoonist Jay Stephens is part of a very exclusive group. He was the subject of a full-length “Palmer’s Picks” twice. The only other artists to hold that distinction are Eddie Campbell and Rick Veitch. Take a bow, guys. Maybe I should have sculpted an award statue or put together a fancy plaque or something. 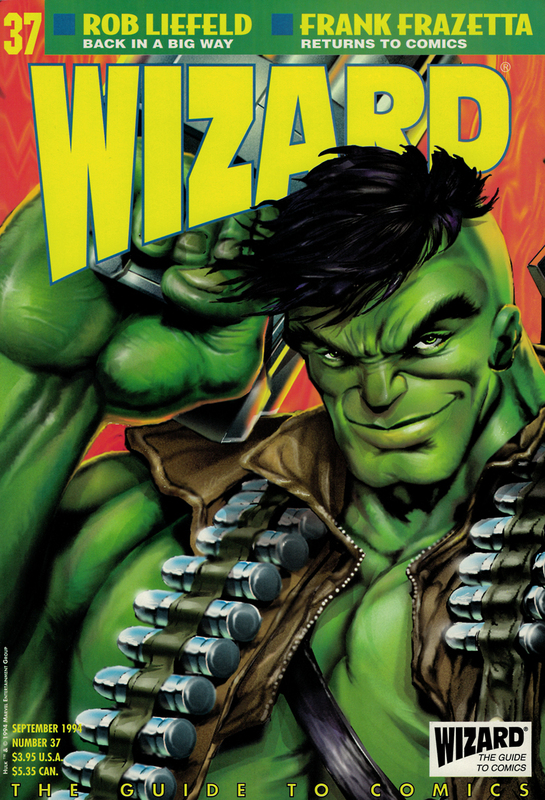 The Hulk cover for Wizard #37, featuring computer-colored trading card art based on Dale Keown’s artwork, is actually one of three different covers for this issue. You’ll have to look around for the other two. Ever hear of Google? While my first profiles of Campbell and Veitch were written without calling them on the phone and their follow-up columns were interviews, Stephens’ double dipping is unique because I spoke with him for both of his appearances in “Picks.” To be fair, it’s hard to tell I talked to Stephens for this first one since I didn’t use any quotes from our interview. But my notes tell me I did, and my notes never lie. So what was the factor that made me write about Stephens twice? Well, aside from the fact that I thought his comics were great, he took the initiative and reached out to let me know his new series Atomic City Tales was being prepped to launch in the summer of 1994. That gave me enough lead time to make sure that this issue of Wizard was going to be in stores alongside the series debut. This was the first time that I was able to coordinate my column with a comic’s release date and, as “Palmer’s Picks” went on and I started building up my contacts within the industry, it became the norm. There’s another reason this particular column is notable. After thirty appearances in “Palmer’s Picks,” the original caricature that my dad drew of me was retired and replaced by the new art that appears alongside the logo. No more happy-go-lucky TPJ tapping away at a typewriter! My cartoonish avatar got a fancy computer even though I was still doing all of my work on my trusty Brother word processor. I was quickly approaching my twenties and even grew a goatee to let everyone know. This was the ’90s, after all. Not many comic creators take chances like Jay Stephens. After finally finding a comfortable home for the “anything goes” format of Sin Comics, Stephens has decided to drop everything and start Atomic City Tales, a new comic that features, of all things, superheroes! For most artists, a switch to superhero comics would equal a rise in sales, but Stephens runs the risk of alienating the fans who have grown accustomed to his wacky, irreverent humor and offbeat funny-animal characters. Luckily, some of the loose ends from the company were picked up when former Tragedy Strikes editor Michel Vrana started Black Eye Productions, the publisher behind most of Stephens’ current work. Black Eye put out two issues of the new and improved Sin Comics before Stephens replaced it with Atomic City Tales. Stephens’ new superhero work seems to be more of an evolution than an abrupt shift of direction. The original version of Sin featured the Sinister Horde, who starred in a superhero strip that ran alongside Stephens’ quirky Land of Nod stories, as well as the adventures of Badman, a crime fighter who was actually a thinly disguised Jay Stephens. When the new Sin Comics series debuted, Stephens killed off most of his funny-animal characters to make room for superhero comics that prefigured the characters in Atomic City Tales. Even the wacky characters in Sin and Sin Comics, like Stephens himself, were fans of cheesy comic books. In fact, Atomic City Tales has the same humor and many of the unexpected twists that are a trademark of Stephens’ work. In Atomic City Tales, Stephens has created a comic that doesn’t neatly fit into one specific genre. It isn’t really an “alternative” comic because it’s about superheroes. It can’t be a modern superhero comic because it isn’t “grim and gritty.” It’s not like the musty and moldy retro-super-hero comics because the characters and situations are updated and distorted with a ’90s bite. Stephens complicates categorization even further by taking an offhanded dig at autobiographical comics and making himself one of the characters in the comic. Stephens has honed his writing and art skills with Sin Comics and Atomic City Tales. The stream-of-consciousness plotting of the original Sin has developed into a method of telling a definite story that takes some pretty bizarre turns. Big Bang, the main character in Atomic City Tales, has the power to bend reality, giving Stephens the freedom to do pretty much whatever he wants as a creator. Stephens is even able to add the unrestrained wackiness of his non-superhero work to the mix of Atomic City Tales. Instead of using his powers to solve the world’s problems, Big Bang becomes a superhero, forms a super-hero team, and gets into fights over parking spots. Probably the most dramatic development in Stephens’ talents has been in his artwork. The somewhat-rough cartooning of Sin has grown into a bold, clean style that evokes the innocence of old superhero comics and combines it with a modern sophistication. Stephens still has the sense of experimentation and originality that made his early comics so engaging. He switches styles when illustrating his non-superhero work and has been able to recreate the feel of an old superhero comic book with his simplified panel layouts and page designs. If you’re already a fan of Stephens’ funny animal characters, you’re probably concerned that you may never again see the adventures of Nod, Irwin, or Dave. Stephens promises that all of his other characters will return in the future. In the meantime, he’s landed a weekly comic strip appearing in alternative newspapers, a full-color comic strip called Bug Patrol for Nickelodeon magazine, and an animated segment on a children’s show in Canada. With all of this exposure recently, it will be difficult to pass up Stephens’ work. His shift to superhero comics has taken his work to a new level while still retaining the spirit of his early work. He manages to infuse all of his comics with a childish charm and playfulness that’s so amusing that the reader can’t help being drawn into the fun and insanity. There have been a few minor changes in “Palmer’s Picks” recently, and most of them have been suggested in your letters (yes, people actually do write letters to me, and I really do read them!). So if you’ve got any ideas on how this column could be better, send them to me at Palmer’s Picks, c/o Wizard Press, 151 Wells Ave., Congers, NY 10920-2064. Rare Bit Fiends: This new series from Roarin’ Rick Veitch promises to be one of the most fascinating and experimental comics of the year. The acclaimed Bratpack and Maximortal creator has transcribed his nocturnal wanderings in this unique dream diary. Check out the first issue From King Hell Press now before it’s too late! Tom Palmer Jr. is a 20-year-old freelance writer based in New Jersey who hopes he won’t be bald before he turns 25. Atomic City Tales: The first issue of Jay Stephens’ new comic is out now. If you can’t find it, you can bug the heck out of your local comic book retailers until they order copies or you can send $2.95 to Black Eye Productions, 338 Kribs St., Cambridge, Ontario, Canada N3C 3J3 (four-issue subscriptions are available for $10). Sin: Jay Stephens’ first comic series was originally published by Tragedy Strikes Press. Five issues were published, and hopefully you can find them at your local comic shop. Sin Comics: If you’re really lucky, you can still find the two-issue run of this comic book, also by Stephens. If your luck has run out, you can order copies from Black Eye for $3.50 each. Sputnik and Reactor Girl: Sputnik is Black Eye’s new magazine/comic anthology. Each issue contains (among other things) a story by Stephens. You can order copies of the first issue for $5 and subscriptions for $16.95 from Black Eye. The first five issues of Reactor Girl, an anthology published by Tragedy Strikes, feature stories by Jay Stephens, including “The Strangest Kid in Comics,” starring Sparkie McGee. Like his other Tragedy Strikes work, you’ll have to search back issue bins at your local comic shop to find these books. Miscellaneous: Stephens work pops up in a lot of unexpected places. Some of his other stuff includes Bug Patrol, a full-color strip appearing in Nickelodeon magazine; Wonderduds, an animated segment designed and written by Stephens for Squawk Box, a half-hour series set to debut this fall on Canadian television; and Oddville, a comic strip running in weekly alternative papers. Acme Novelty Library; by Chris Ware, from Fantagraphics. Hectic Planet, by Evan Dorkin, from Slave Labor. Pickle by Dylan Horrocks, from Black Eye. Jim by Jim Woodring, from Fantagraphics. Cereal Killings, by James Sturm, from Fantagraphics. Madman Comics, by Mike Allred, from Legend/Dark Horse. Hellboy, by Mike Mignoia, from Legend/Dark Horse.